For local tourist information, go to Cape-Sable-Historical-Society on Facebook. The first light tower was built of wood in 1861 close to the southern seawall. On November 12 the first lightkeeper, John Hervey Doane, lit the lamps atop the 65 foot octagonal tower. Because more lives and property had been lost at Cape Sable than on any other part of the coast, the installation of a white light of the first order was recommended. However, the decision was made to provide a red light on the cape. This red light, with nineteen lamps, was by far the most expensive to operate of any on the coast. On a clear night, it could not be seen over a distance of eight miles. Four-sevenths of the power of the light was lost through the thick red glazing of the lantern. In 1869, the lantern glazing was changed to clear with ruby chimneys on the lamps to show a red light. This greatly improved the range. 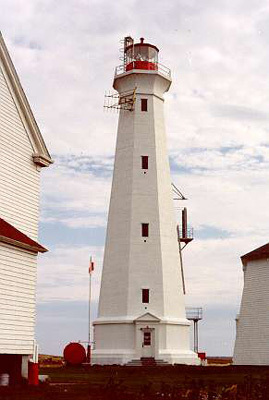 Recommendations were made to have two lighthouses on Cape Sable, both showing a white light. These would not only serve to distinguish this point from any other on the South Shore, but they could be arrayed as to guide the mariner clear of the dangerous shoals lying to the west of Cape Sable. In 1870 a clockwork mechanism was installed and on 15 July, the light was changed to flashing white. On 1 July, 1902, installation of a 3rd order Fresnel lens was completed. A fog alarm building and steam-whistle came in 1876. In 1897 a 16 foot lifeboat was placed at Cape Sable. Lightkeeper Isaac Doane was coxwain, but he had no organized crew. In 1900, this was abandoned in favour of a new lifeboat stationed at Clark's Harbour, on Cape Sable Island. On its low land-base, the light was not visible far enough to seaward. In 1923/24 a new tower of reinforced concrete, 101 feet from base to vane, was constructed nearby. This is the tallest lighthouse in Nova Scotia. In high winds, the keeper's house would lean sideways! In one direction, the doors would stick, in the other they would pop open. When Sid Smith was keeper, he found the steam fog horn the most interesting equipment to run. Maintaining the light mechanism was hard work. The lamp was kerosene vapour in the 1950's, which meant carrying the kerosene up the light and pumping the pressure tank. The station was de-staffed in 1986, and was remotely monitored from Cape Forchu, Yarmouth. Currently, the light is monitored from Letete, New Brunswick. A variety of buildings and dwellings were erected over the years. They were burned down by the Coast Guard in 1988 and today, only the concrete tower remains. On July 28, 1989, the Federal Heritage Building Review Office designated the Cape Sable Light tower a Classified Building, providing it with the highest level of on-going protection. The Cape Sable Light can be viewed from the beach at The Hawk, Cape Sable Island. It's well worth the drive out the Island to get a view of this magnificent example of a concrete tower. 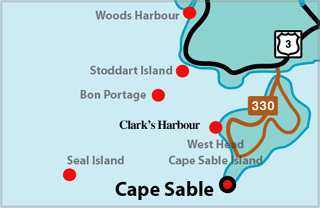 Cape Sable itself is a low, sandy islet about 3 miles long, lying just offshore from Cape Sable Island at the extreme SW corner of Nova Scotia. The Mi'kmaq name for the island was "Kespoogwitik" which meant "where the land ends." As early as 1554, Portuguese cartographers called the area Beusablom, "a sandy bay." French explorer Champlain used the French version of that name, "Cap de Sable," and when New England settlers occupied the land in 1761, the name became Cape Sable. Ledges and shoals run seaward south and west of Cape Sable for 4 1/2 miles, hazardous to all shipping from the start of exploration here. Though vessels and lives were lost, petitions for a light at Cape Sable were set aside until after the loss of the SS Hungarian on February 20, 1860, her crew, and her passengers - 205 souls. Tower Height: 101ft feet high. Light Height: 097ft feet above water level.